"The great thing about homemade burgers is that they can easily be modified accordingly, and these turkey burgers are great for those who are gluten-intolerant, follow a gluten-free diet, or simply wish to avoid bread crumbs in their mixture without sacrificing taste or texture (like me)." Mix ground turkey, onion, almond flour, egg, garlic, basil, seasoning blend, and black pepper together thoroughly in a bowl. Form 5 burger patties using about 1/3 cup of the turkey mixture for each. Cook turkey burgers on preheated grill until no longer pink in the center and the juices run clear, 7 to 10 minutes per side. An instant-read thermometer inserted into the center should read at least 165 degrees F (74 degrees C). 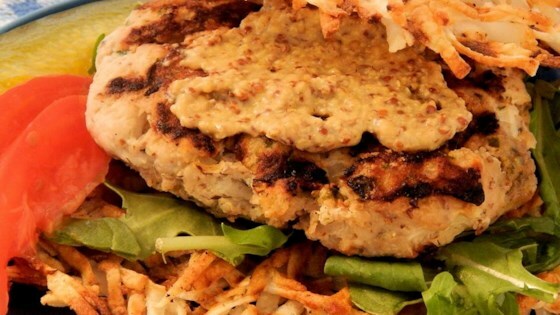 See a great trick for making truly delicious low-fat turkey burgers. The seasoning I used is a Mrs. Dash® blend. You can substitute it for seasonings like garlic powder, parsley, oregano, thyme, coriander, cayenne pepper, cumin, or rosemary to make your own. A burger press comes in handy for forming the burger patties. I must've not made them correctly because they were very wet and sticky, but I gave 5 stars because they were still DELICIOUS! I will make these again; hopefully, the right way next time.